Exploring and caring for special places in the Gulf of Mexico that inspire and connect us all. The application period has closed for the 2019 Lionfish Invitational trips to Flower Garden Banks National Marine Sanctuary and all applicants have been notified of their status. 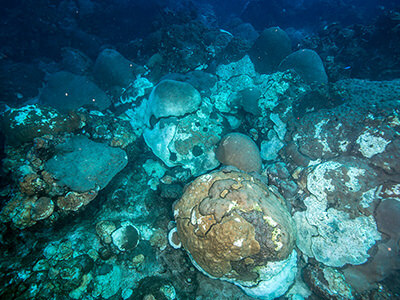 These research expeditions will take place June 9-13, 2019 and August 25-29, 2019 on board the M/V Fling. We'll report out on the success of these efforts following each trip. The Sanctuary Advisory Council meets four times a year to discuss topics relevant to sanctuary management. Past minutes and agendas are available on our Meeting Information page. These meetings are open to the public, with a public comment period beginning at 1 p.m. If you are interested in making a comment at the meeting, please arrive before 1 p.m. to place your name on the comment sheet. If you cannot attend in person, please consider following along via webinar. Webinar information and meeting agendas will be posted closer to each meeting date. 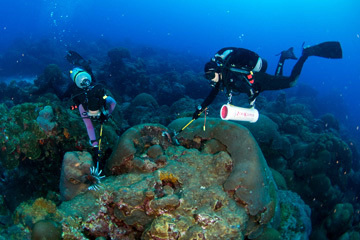 Although the reefs of Flower Garden Banks National Marine Sanctuary (FGBNMS) are normally considered the healthiest in the region, on July 25, 2016, sport divers on the M/V FLING, reported green, hazy water, huge patches of ugly white mats on corals and sponges, and dead animals littering the bottom at East Flower Garden Bank, buoy #4. Sanctuary staff quickly alerted scientists from around the world. The scientific community mobilized, conducting surveys on the mortality site a week later and the following year. 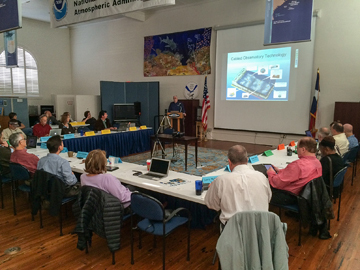 In February 2018, the sanctuary partnered with the Gulf of Mexico Coastal Ocean Observing System (GCOOS) and the U.S. Integrated Ocean Observing System (IOOS) to bring together 40 researchers from different disciplines to discuss possible causes of the mortality event. A new report summarizes their findings. HI-A-389A, a gas production platform located within sanctuary boundaries at East Flower Garden Bank, is no longer visible above the water's surface. Since ceasing production a number of years ago, it was slated for removal. However, based on public opinion, it was decided to leave a portion of the structure in place for fishing and diving. As of July 25, 2018, the top portion of the structure was removed down to 65 feet below the water's surface. 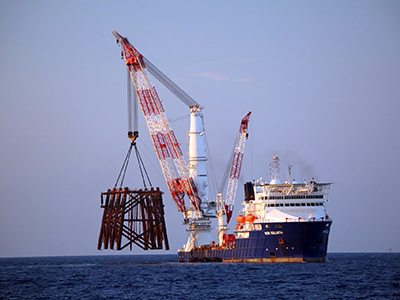 The photo above shows the almost 600-foot long, heavy lift, dynamic positioning vessel NOR GOLIATH lifing the final portion of the upper structure from the water. The lower portion, from 65 to 410 feet, will remain in place as an artificial reef under the Texas Parks and Wildlife Rigs to Reefs program. 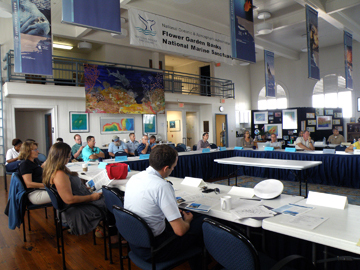 At their meeting on May 9, 2018, the Flower Garden Banks National Marine Sanctuary (FGBNMS) Advisory Council voted to accept the recommendation for sanctuary expansion proposed by its Boundary Expansion Working Group (BEWG). 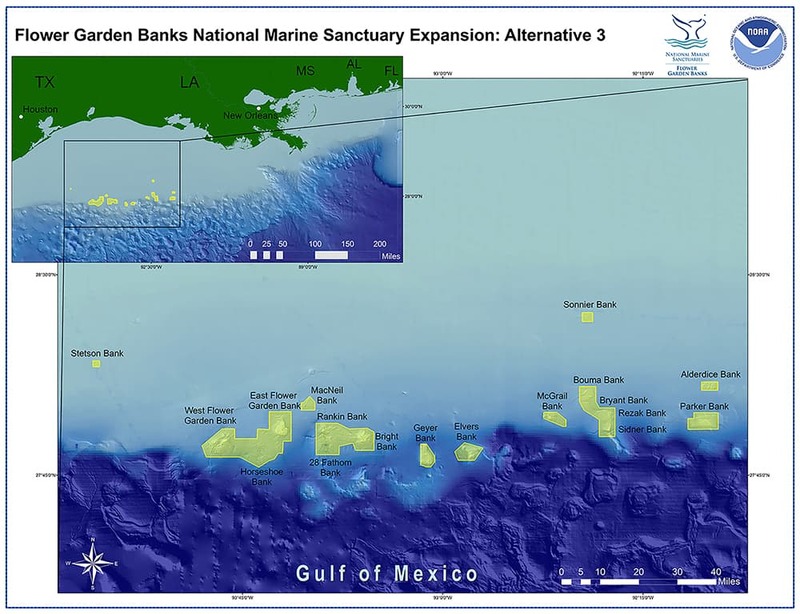 The council’s recommendation supports expansion of FGBNMS through inclusion of 14 additional reefs and banks in the northwestern Gulf of Mexico. If this recommendation is accepted by NOAA, it would expand the sanctuary by approximately 150 square miles, bringing the total area of the sanctuary to 206 square miles. 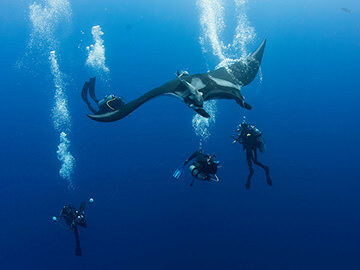 Manta rays have long been a favorite for divers and a focal species for Flower Garden Banks National Marine Sanctuary. But, what do we really know about them? Joshua Stewart, a NOAA ONMS Nancy Foster Scholar and an Associate Director of The Manta Trust, will present on the latest manta research being conducted in the sanctuary. If you missed participating in this great webinar on May 17th, no problem. We recorded the full webinar. Listen in to learn about the manta rays of the Flower Garden Banks: What are they doing in the sanctuary? Why are mantas at FGBNMS so small? What questions about mantas remain to be answered in the Gulf of Mexico? Note: The first 10 minutes of the recording are mostly silence as we waited for people to finish logging in. We just started the recording a bit early. Can’t get to your national marine sanctuaries? Thanks to the wonders of 360-degree photography and virtual reality, these underwater treasures are now just a few mouse clicks away. 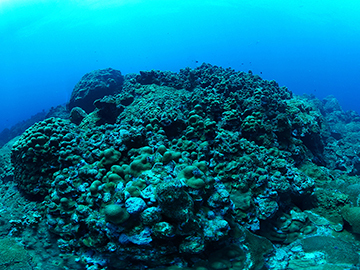 NOAA’s Office of National Marine Sanctuaries has launched a virtual dive gallery, complete with immersive 360-degree views of five national marine sanctuaries including the Flower Garden Banks. Would you like to receive regular updates about sanctuary news and events? 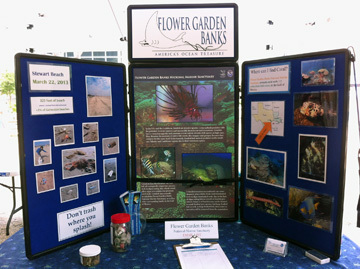 Want to learn more about diving and fishing issues in the Gulf of Mexico? Or perhaps you'd like to know more about volunteer or research opportunities? Maybe education resources? We have 6 different email lists designed to keep people informed on these sanctuary-related topics. All you have to do is sign up!